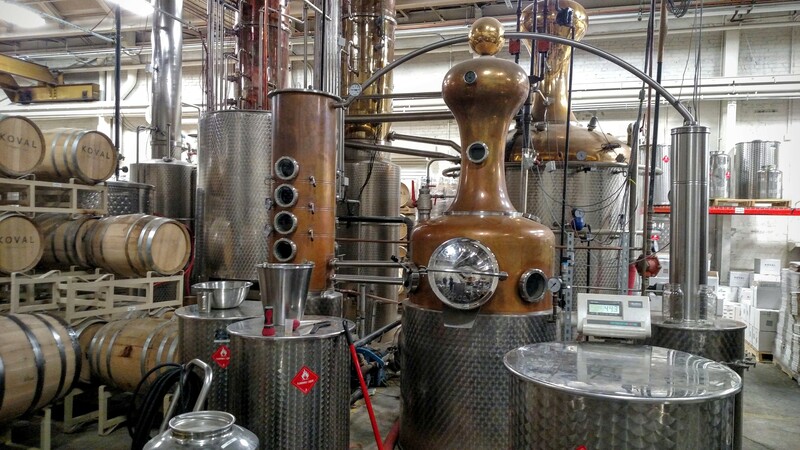 In our ongoing mission to provide insider news on the Chicago bourbon scene our journey took us to KOVAL Distillery on Chicago’s north side. Becky Shultz, Communications Coordinator for KOVAL was kind enough to give us a tour and answer a few questions. The KOVAL website has a good amount of history, the origin of the name and story of it’s founders, Robert and Sonat Birnecker. They do a great job of telling the story of how the company came to be. I encourage you to stop by for a tour or one of the many classes they host. 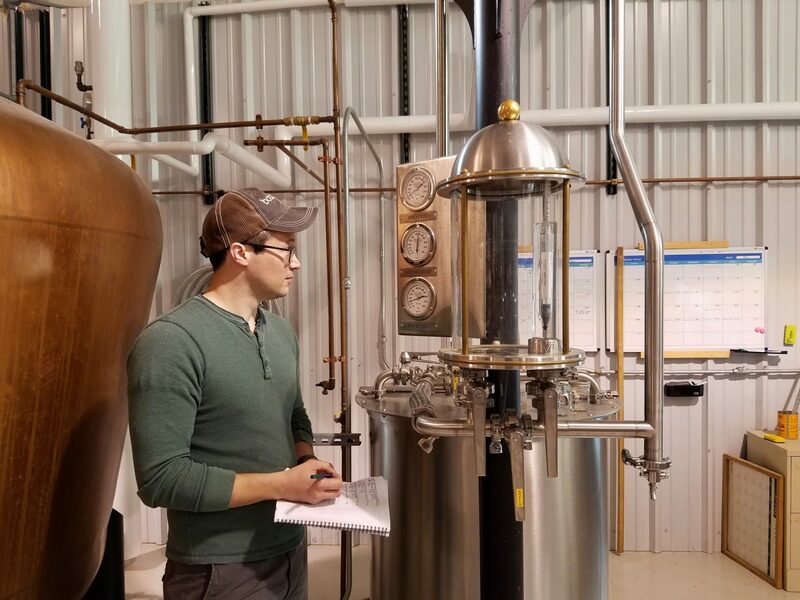 Read on for our dive into the Austrian distilling process used at KOVAL and a peek at what’s coming next for the distillery. KOVAL does things a little different than most other distilleries we’ve visited. The result of these differences is apparent in the profile of the spirits they produce. 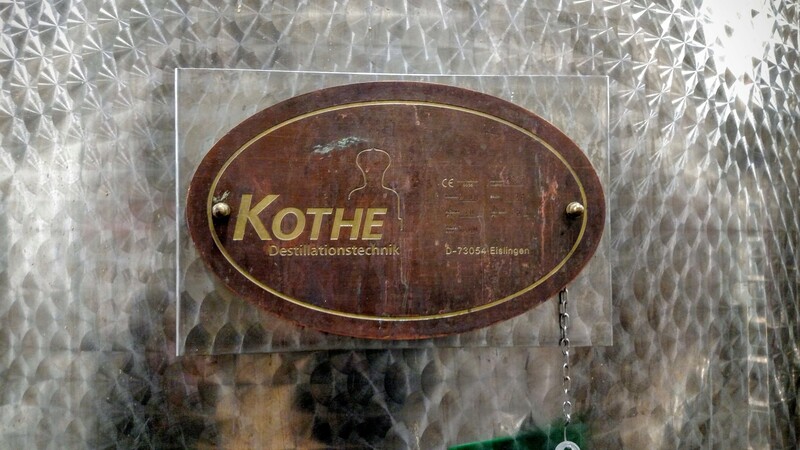 First off, they use a custom hybrid pot still from the German company Kothe. They currently have two stills in operation. 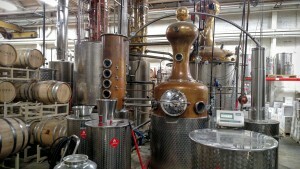 Their OG 300L still is now used solely to produce a new gin. Their newer big boy still holds 5,000L and is fully computerized. We were told they run two full cycles a day on the stills though they are capable of running continuously. The next rather unique take on distillation is that they use only the hearts from each run in their final products. The heads are tossed as usual; the tails receive a second run for the vodka or gin lines but won’t end up in the whiskey or bourbon. Sampling their white, unaged, whiskey we’ll confirm it was probably the smoothest we’ve tasted. The final observation we had regarding their unique process is the use of 30 gallon barrels with a #3 char crafted by The Barrel Mill. The industry standard barrels holds 53 gallons. Why use smaller barrels? Well I’m glad you asked. The smaller the barrel the more liquid comes in contact with the wood. If you’ve ever used a one or two liter barrel for home aging, like the ones from our friends at Buy Oak Barrels, you’ll know that the aging process runs a whopping 8-10x faster than a full size barrel. 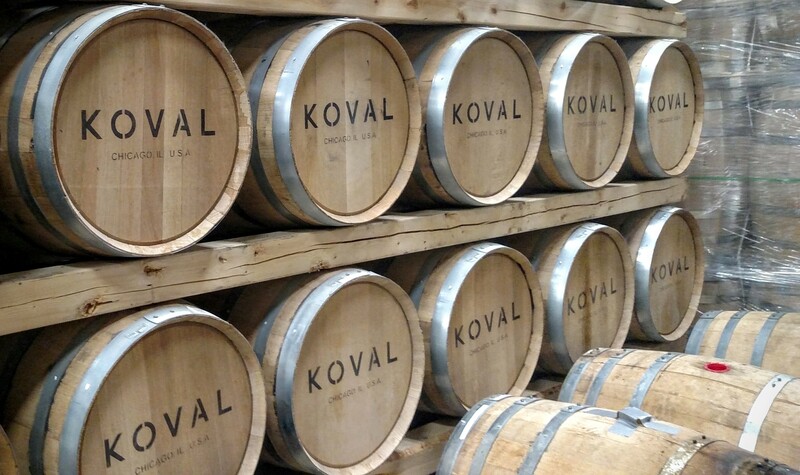 The smaller barrels used by KOVAL gives them a more mature tasting product in less time. As required by law, their bourbon barrels are used only once. But they take it a step further and use their whiskey barrels only a single time. Becky tells me they want to extract the most flavor from the wood for their whiskeys. Let’s get into the whiskey. 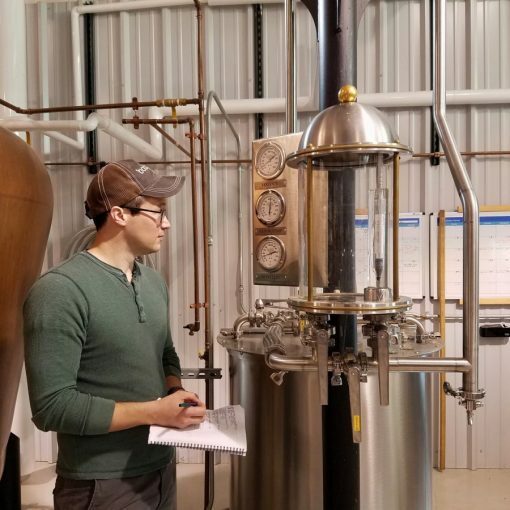 The story of how KOVAL got into whiskey making is pretty cool. Back in 2008 they started out with the intention of making a pear brandy. On the way to the distillery the shipment of pears froze, thanks Chicago winter. Being quick on their feet and not wanting to postpone production they obtained the next available grain, rye. This led to their very first batch of rye whiskey. If you know the history of American whiskey you might remember that early distillers made rum. As they migrated inland, away from the seaports, the raw materials to make rum became scarce. What wasn’t scarce in the midwest? Rye! This led early distillers to switch to making rye whiskey out of necessity. Anyway, time machine back to 2016 and the KOVAL distillery. All of KOVALs six whiskeys are single barrel expressions. This is more challenging than the typical process of combining many barrels in a dump tank to achieve a desired flavor profile. The bourbon or whiskey that comes out of a barrel at KOVAL is what you taste from your bottle at home. All the more reason their process and attention to detail must be top notch. Their bourbon doesn’t carry an age statement but we were told it is aged two to four years. 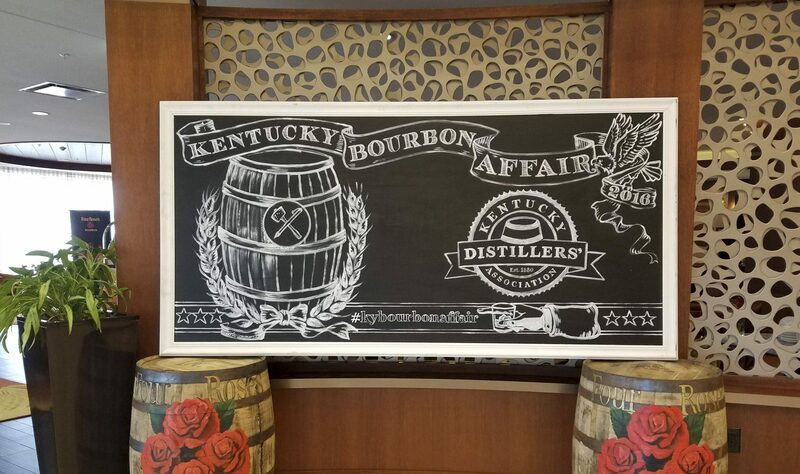 The bourbon carries a mash bill of 51% corn and 49% millet and is bottled at 94 proof. They also produce a four grain whiskey consisting of malted barley, rye, oat, and wheat. Another cool thing they do at KOVAL is their “Barrel Program”. If you run a bar or restaurant you can sample and choose your own blend or single barrel whiskey/bourbon to serve as a personally selected KOVAL spirit. We assume if you’re an avid home drinker they wouldn’t turn you away from doing the same thing. On a personal note if you happen to order a barrel for your house let us know and we’ll gladly stop by for a drink. 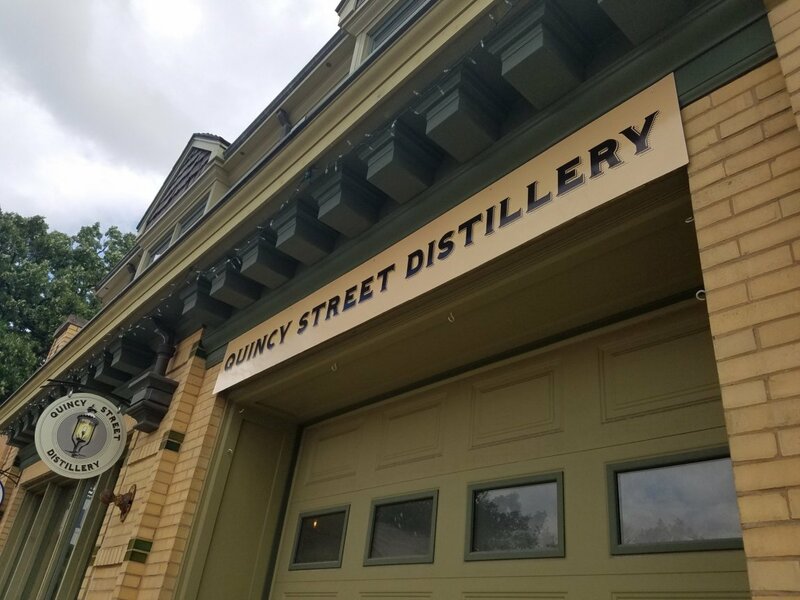 After our tour of the distillery we sat down with Becky to sample the spirits. We sampled the Oat Whiskey, the 100% Rye, Bourbon, Four Grain Whiskey, White Dog, and for good measure their newest product KOVAL Gin. All of the whiskeys are pleasantly smooth. Other whiskeys at this age and using small barrels don’t always turn out this way. This is where KOVALs Austrian style of distilling, using only the hearts, single use barrels etc, comes in to round out the flavor and provide a pleasant experience. Becky’s personal favorite is the Oat Whiskey for its smoothness, lack of heat and mild spice notes. Our preferences were the bourbon and the four grain whiskey, both bottled at 94 proof they are bold and peppery with a kick at that higher proof and a sweetness to round out the flavor. While we’re not gin experts the gin was enjoyable. Becky said that a grapefruit peel and mint complement their gin instead of a typical lime wedge. KOVAL is looking for a larger space to expand operations. No surprise as their products are doing very well and demand is high. They are also working on a number of collaborations this year with local and remote distillers/brewers. I can’t share who they are collaborating with but can say the first one is slated to be released within the next couple months. Currently KOVAL distributes in 40 states and 12 countries. Even pre-expansion you should be able to find a KOVAL spirit to enjoy without too much trouble.